San Diego has the perfect year round climate. Not too hot in the summer and not too cold in the winter. Who wouldn’t want to live or vacation there. I sure would. It also has a bustling population with some professional sports teams. Plus the beaches are pristine. Since it’s a popular destination and it’s in California the hotel rooms tend to be really expensive unless you find a real sketchy motel room that is no where close to the beach. If you want an affordable place to stay then I recommend renting an RV in San Diego. When you rent an RV then a lot more area opens up to you. Plus you can go on little adventures that are close by. Renting an RV is definitely the way to go. This is my favorite way to rent an RV. This is the RV version of AirBnb. Basically you have a couple different website such as RVShare or Outdoorsy. If you’re an RV owner then you list your RV on the website then wait. If you are looking to rent an RV then you go to RVShare and type in the location you are planning on going such as San Diego and then you choose the RV you want to rent. It’s very straight forward and it is really affordable. Check out my full RVShare review here. I have had really good luck with it but when booking you have to use some common sense such as not waiting till the last minute to book and not picking an RV that looks all beat up. Overall this is my top recommendation when renting an RV in San Diego. Cruise America has been around for a while and they are actually not that bad. I have used them before and I had a good experience. You have to be careful and know exactly everything you will get charged for such as using the stove, toilet and kitchen utensils, etc. You will also be a traveling advertisement for them with their name and phone number plastered all over the RV. If you are fine with all that then I say check it out and see if it works for you. Also be aware of what you get charged per mile after the allotted amount. When I rented it we were very careful and planned ahead to know exactly how far we were going to be driving. 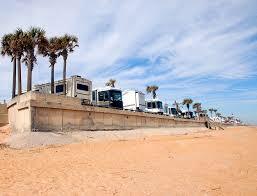 You will have RV dealerships that will rent out RVs along with selling them. I have not had much experience with this but have checked out a lot of RV dealership websites that rent RVs out. From what I can tell they tend to be a bit more expensive but overall you get a quality RV that does not have advertisements all over so you don’t look like a total tourist. Not everywhere will have this option but bigger tourist destinations will. This is basically a brick and mortar place that only rents RVs and Travel Trailers. I have seen prices really high and competitive prices for locations such as these. I would recommend thoroughly investigating them out online before booking. Again I don’t have any experience booking through locations like this so please do your due diligence before booking. You have a lot of good options when renting an RV in San Diego. My favorite being the peer to peer option but if that does not work for you then definitely try the others.